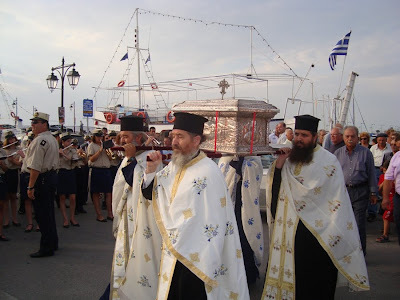 Between August 4-11 in 2009 the relics of St. Joachim were brought to the island of Lefkada, which neighbors Ithaki, to be venerated by the faithful. Hundreds took part in the procession and there were celebrations throughout the island. As was proper and natural, the place of Saint Joachim’s spiritual birth assumed the duty of bringing to light and honoring its saintly offspring. In 1991, the Abbot of Vatopaidi Monastery, Archimandrite Ephraim, and fathers of the Monastery went to Ithaki and, with the help of the inhabitants of the island, identified the place of the Saint’s grave. They arranged with the Metropolitan Bishop of the diocese for the translation of the Saint’s relics on May 23 of the following year, 1992. News of this forthcoming event soon became known to the people of Ithaki, as well as to the faithful throughout all of Greece. Abbot Ephraim, with two fathers from the Monastery, went to Ithaki on the appointed date. With the blessings of His All-Holiness Bartholomew, the Ecumenical Patriarch; with the assistance, solidarity and cooperation of Metropolitan Nikiphoros of Levkas and Ithaki; and with the ardent help of the officials and residents of the island, they were able to carry out the translation of the Saint’s relics. This liturgy was attended by numerous priests and monks and a multitude of people who had thronged together to attend this historic and joyous event. Following the Divine Liturgy, they began the process of the translation. At the Saint’s grave, which had been transformed into a small chapel, a few of the faithful began breaking up the flooring with sledgehammers, while the rest of the people were exuberantly singing “Christ is Risen.” Indeed the event was Resurrectional and fitted perfectly with the Paschal period of the Pentecostarion, in which it took place. Soon, amid a general atmosphere of pious emotion, monks who were digging at that moment found the first piece of the holy relics and, shortly thereafter, the Saint’s holy skull. Finally, they gathered all of the pieces of the holy relic that they washed and accordance with the usual ordinance, they were washed and arranged. It is worth pointing out that Saint Joachim had prophesied, “A priest from the Holy Mountain, with a red beard, will take me up [his relics] and be the first to bring me to the people.” This prophecy indeed came true in the person of the Abbot of the Holy Monastery of Vatopaidi! It is also noteworthy that the Saint had appeared to a priest in his sleep on the eve of the translation. He told him, “During the translation, I will satisfy everyone.” In fact, initially there was a dispute about who had the right to take the Saint’s skull: the Monastery or the Diocese. In the end, however, there was no problem; as soon as they removed the grace-filled skull of the Saint from the grave, it split in two! That same day, Abbot Ephraim and his company set off for Vatopaidi Monastery, arriving the following day. The brotherhood reserved an especially fervent reception for the Saint, who was returning after nearly 170 years to his beloved monastery, which he had abandoned in order to serve the people of God, particularly in his native homeland of Ithaki. “Who has known the mind of the Lord, and who has been His counselor?” (Isa. 40:13 LXX; Rom. 11:34). Although we have attempted in these pages to portray a true friend of God, I am afraid that we may have instead slighted him; for if God has judged that someone is righteous, that person “is judged of no man” (1 Cor. 2:15). How are we then in a position to describe him? Nevertheless, we are not able to refrain from admiring the remarkable extent of this holy man’s influence and sway over the entire population of his island — not only then, through his personal presence, but now as well, after more than a century, through his deeply engrained presence in the memory and soul of the Ithacan people. Listening to the Ithacans talking about Papoulakis, one would think that the Saint is living and walking among them today. This is not something coincidental, but yet another witness to his boldness before God and to the twofold love of God and neighbor that this imitator of Christ so thoroughly cultivated. His dedication to God — and his success, by God’s grace, in living in “His likeness” — was followed by an equally fervent love for his “neighbor.” Consequently, he spent the rest of his life instructing the people and became, according to the maxim, “all things to all people” so that, were it possible, he might console and comfort everyone. Having divine illumination and the charisma of clairvoyance to complement his love toward his neighbor, he unerringly guided God’s people in the various circumstances of life. He liberated every inattentive soul held captive by ignorance or indifference and truly became the savior and teacher of the entire island; this is why today (rightly) they revere him and are so attached of him. Behold, therefore, an image of a true teacher and educator, of a spiritual father and director, who exemplifies the genuine laborer in the spiritual harvest, one whom the Lord indicates that we should seek out. This blessed man “gave no sleep to his eyes, nor rest to his temples” (see Ps. 131:4 LXX), “nor did he desire the day of man” (see Jer. 17:16), but rather took on the pain and the problems of all the people, fulfilling his vocation with prudence, “doing and teaching” (see Matt. 5:19) whatever was of benefit. The words of Paul, “I discipline my body and bring it into subjection” (1 Cor. 9:27), were his constant companion and preoccupation; this is why he was often seen transporting flagstones and other loads on his shoulders, which he would then put to use for the construction of the church that he himself had undertaken to build. His abstinence and self-denial were legendary, as everyone declared; but how could it have been otherwise? According to the testimony of his relatives and friends, when he was still an infant he refused to nurse on Wednesdays and Fridays. What else could this mean but that he was immersed in the grace of the Holy Spirit from the time of his birth? Our fear is therefore justified that perhaps we have diminished such a hero of the love of God and neighbor, who not only “at that time,” but in recent times as well has proved the power of Christ to perfect and regenerate those who desire to join the ranks moving on this course to heaven. The power of Christ, which gives strength to all things, still today provides the power “to become children of God” (Jn. 1:12) to those who are willing to take up the cross. Never before has there been so urgent a need for this witness as there is today. One other particular grace and virtue that distinguishes the Athonite fathers and, of course, our blessed father Joachim is their deep humility. Out of this humility, they have always kept hidden the supernatural qualities with which Divine Grace adorned them. Blessed Papoulakis also habitually hid his prophetic gifts. Whether he was healing the sick or whether he was foretelling the future to others, he would hide behind some pretext or point to some natural reason so as not to be discovered. O Blessed Joachim Papoulakis, our holy father and intercessor before God, having been released from the bonds of this toilsome life and translated into the court of the Kingdom, cease not to plead for us your humble brethren at Vatopaidi, the holy Monastery of your repentance, which makes its boast of you as its child. Though out of obedience you had abandoned her, thus fulfilling the law of love towards our people, today we feel you, together with the rest of your fellow ascetics and the entire choir of your Monastery’s Saints, standing among us lowly ones who desire to be saved. Olga Konstantinou, a resident of Korydallos, Athens, had gone to the translation of Blessed Papoulakis’ holy relics in May of 1992. Searching carefully in the earth that had been dug out during the exhumation, she found a small piece of the Saint’s holy relics, which she kept as a blessing. During her departure from Ithaki on the small ship “Thiaki”, the holy relic of the Saint began giving off a wondrous, otherworldly fragrance, according to the general testimony of many pilgrim passengers, who venerated it with devotion. Having arrived at her home in Korydollos, a bad thought passed through her mind that now she was going to have to keep a third “perpetual” vigil lamp burning, meaning she would be spending more oil. To her surprise, however, and with great emotion, she realized that on the fourth day the oil lamp before the Saint’s holy relic had been burning for three full days without the level of the oil going down. With contrition she asked forgiveness from the Saint. From then on, the oil burned normally. Dorothea Paxinou, having lived for many years in South Africa, knew little about Blessed Papoulakis. In March of 1992, being unaware of the translation of the Saint’s holy relics that was about to take place, she had a vision. She was in her room when suddenly the door opened and a venerable elderly monk entered wearing an old grey habit and a skoufo [monastic cap] on his head, exactly as the Saint is portrayed in his well-known portrait. He drew near her and said with kindness, “Do you have devotion for St. Barbara? Know that today the village of Stavros has another Saint. Immediately the Saint vanished from before her. Mrs. Paxinou was very moved, because she indeed did have a special devotion to Saint Barbara. On the day dedicated to Saint Barbara’s memory, she had given birth to her son Gerasimos, the current president of the community of Lefki. At dawn on November 25, 1995, “between sleep and awake”, as she herself describes it, Evstratia Stanitsa-Sykiotis, a resident of Stavros, heard a serious elderly voice tell her: “The time for my glorification as a Saint is approaching. Tell the villagers, however, that I do not want revelry.” Early in the morning, Mrs. Sykiotis went to the local school and revealed this miraculous sign to a teacher who had a special devotion for Papoulakis. Here, unfortunately, we must point out the two-day revelry that takes place on 5-6 August in Stavros, during the celebration of the Feast of the Savior’s Transfiguration, with the grievous accompaniment of roast meat (it is a lenten season), drunkenness, and such. Maria Kollyvas-Argyris and her son Efthymios Argyris, residents of South Africa from Ithaki, relate that in 1971, while they were living in the district of Agioi Saranta in North Ithaki, little three-year-old Efthymios became sick with a very high fever. The family doctor, along with other specialists, was not able to discover the reason for such a high fever. The weary parents took turns at night staying up at their sick child’s bedside. One evening, the distressed mother Maria, worn-out from agony and sleeplessness, fell asleep for a little while sitting at the edge of the boy’s bed. In her sleep, she heard the sound of elderly footsteps and the tapping of a walking stick moving from the sitting room towards the bedroom. She opened her eyes and saw live before her an elderly monk entering the room. His face was kind and full of light, and he was wearing a skoufo and holding a staff in his hands. “Saint Nektarios!” cried Maria with joy. “I’m not Saint Nektarios, Maria,” responded the unknown monk, gazing with sympathy at the sick child. “I am Saint Papoulakis. I’ve come to see how the grandchildren of Diamantia are doing. She continually prays to me for you.” Immediately the Saint disappeared in front of their eyes. The next day, early in the morning, the family doctor communicated with the Argyris family in order to inform them with joy that they had found the cause of the boy’s feverish condition. An inflammation of the blood had developed from the bite of a parasitic insect. With the proper therapy, the child became completely well in no time. The same day, the happy parents telephoned their relatives in Ithaki to tell them the joyful news. They asked them to go light oil lamps and candles at the Saint’s tomb. That summer, having gone to the island for their vacation, they took little Efthymios to venerate at the tomb of Saint Papoulakis, at the church of Saint Barbara in Stavros, glorifying and giving thanks to their holy patron. Several years ago, a pious elderly woman, Niki Patrikios-Tsonos, a resident of Kypseli, Athens and a distant relative of Saint Joachim, had vowed to have the silver reliquary for the Saint constructed at her own expense. Around mid-June, 1998, she had a “live” dream, as she herself describes it. Saint Joachim appeared to her in her sleep wearing the monastic “koukoulion”, or veil. He told her, “Please, Niki, do not forget that which you promised me.” Niki woke up immediately and made a rough sketch of the Saint’s appearance on a paper napkin, because his head covering had made a particular impression on her. She had known him differently, according to the more well-know portrait that has survived until now. Here we must point out that at that same time in Cyprus a holy icon of Saint Joachim was being painted — which would then be taken to the Holy Monastery of Vatopaidi by the Bishop of Kyrineia (Kerineia) in Cyprus, Mr. Pavlos - in which he is depicted with a koukoulion! Some years ago, Efthymia Sophianos, who lives in Vathy, Ithaki, used to keep at her home the “Holy Belt”, which Blessed Joachim had given to the grandmother of her mother, Maria Molphesis-Sophianos. This holy relic was a light-brown belt embroidered with gold thread. It was kept at the Sopfianos family’s icon screen and was given to virgin daughters, who would wear it during their marriage service, tied around their head or waist as a virginal symbol. This was considered a great blessing. Afterwards, the Holy Belt was returned to the Sophianos family. The last request for the Belt was by a refugee family in 1935. In the Sophianos family they also used to bless the children with the Holy Belt at home when they were sick. Unfortunately, the Holy Belt was lost during the catastrophic earthquakes of 1953. Christina Kallianos-Papadatos from Ithaki, now residing in the district of Harabolta Argostolios on Kefallonia (Cephalonia), had gone to the translation of the holy relics of Blessed Joachim, together with her children Gerasimos and Eirini. They were accompanying the nun Magdalene from the Holy Monastery of the Holy Apostle Andrew on Kefallonia. During the translation, Christina took as a blessing one of the clay tiles used to cover the head of the Blessed Joachim in the tomb. In the spring of 1993, as Christina was tending the animals in the farmyard she fell and struck a tree hard, resulting in a mild concussion. Because she was feeling strong pains, she went to the Argostolios Hospital, where the doctors recommended that she remain for 24 hours as a precautionary measure. Having a deep faith in Saint Joachim, Christina chose not to stay and instead returned home. Her son Gerasimos - now studying for the priesthood at the Rizario Ecclesiastical School - chanted the supplicatory canon to the Saint, and they prayed with faith. Christina placed the Saint’s clay tile under her pillow and, in the morning - glory to God - she woke up completely well. She has also given a large monetary sum as a votive offering towards the future church to be dedicated to Saint Joachim. Sophia Vlassopoulos-Grivas, a resident of Lakos, Ithaki, relates that in the nineteenth century Blessed Papoulakis’ cousin, Nikolis Patrikios, and his wife Zacharenia were living in the house she now lives in. Saint Joachim visited them many time, especially during the winter evenings. At night he would repose on a chest in the kitchen of the old house. One night, Nikolis woke up and discovered that the Saint was no where in the house. He went outside and dumb-founded he saw the Saint praying in the garden, surrounded by light and suspended three feet above the ground! Nikolis was very shook up. The Saint immediately calmed him down, saying, “Don’t be afraid, Nikolis; I was saying my prayers.” He also admonished him to tell no one about what had happened. Adamantini Kouvaras-Noutsatos and Evrikleia Koubaras-Sompolas, residents of Stavros, relate that around 1938-39, their grandmother Diamantia, wife of Dimitrios Sykiotis, became sick at the age 48. A fibrous tumor had developed in her female organs, from which she suffered frequent hemorrhaging. Two doctors from North Ithaki, I. Pazis and S. Vrettos, seeing the adverse progression of her health, decided that she must leave urgently for Athens to have an operation. Here we should note that Diamantia, nurturing a special love and devotion for Saint Papoulakis, never ceased to call upon him and to pray about this trial with her health. Using D. Sikiotis’ flat cart – the means of transportation of that era - she and her husband went down from Stavros to Vathy, intending to depart with the ship going to Peiraia. At the harbor they met with Dr. N. Kolyvas, who also confirmed the precariousness of her condition. Suddenly at that point, Diamantia, feeling a deep faith in Saint Papoulakis, decided to return to the village and make a votive offering to Papoulakis for her health. Her vow was to never again dress in a worldly way. Her husband, her five children, and her grandchildren always remember her dressed for all of forty years without light-colored clothing, with a scarf on her head, and never wearing high-heeled shoes or carrying a handbag, even at very informal family moments. She was always close to the church — as she always had been — maintained a sacramental life, and was a regular pilgrim at the tomb of Saint Joachim, doing countless prostrations before his icon. [St. Joachim was officially canonized a Saint of the Orthodox Church in 1998 by Ecumenical Patriarch Bartholomew. His official feast day is May 23 (the date of the uncovering of his relics). The hymns for this feast can be found here. Ἀπολυτίκιον. Ἦχος γ´. Θείας πίστεως. Θεία χάριτι λελαμπρυσμένος κατεφώτισας τοὺς ἐν σκοτείᾳ ἀγνωσίας καὶ δουλώσεως πέλοντας ταῖς διδαχῶν καὶ θαυμάτων ἀκτῖσί σου, Ἰωακείμ, ἀσκητὰ ἐνθεώτατε· γόνε πάντιμε Ἰθάκης, Χριστὸν ἱκέτευε δωρήσασθαι ἡμῖν τὸ μέγα ἔλεος. Shining with divine grace, you illumined those caught in the darkness of ignorance and apostasy by your teachings and radiant wonders, Joachim, most-divine ascetic, all-precious offspring of Ithaki, entreat Christ to grant us great mercy.